One of the best things about SummerWorks is the chance to experience various types of theatre for a reasonable admission price. Even better, is the fact that there are quite a few double bills on this year’s playbill. That’s right, two shows for the price of one. 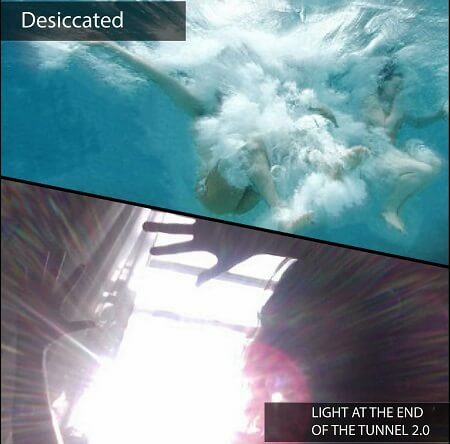 I had the chance to see Desiccated and LIGHT AT THE END OF THE TUNNEL 2.0 Saturday afternoon. And although both productions shared the same ticket, they could not have been any more different. Desiccated is a thoughtful and provocative multi-disciplinary work that examines the misuse and mistreatment of the world’s oceans. The set itself is almost entirely comprised of plastic water bottles, which not only create a stunning semi-transparent lighting effect, but also play an important part of the narrative structure. In one moment, the dancers become entangled in a chain of the plastic bottles. It is during this time that they give a compelling pantomime of struggling to their demise, much like the same way that many aquatic lifeforms are unnecessarily being harmed by ocean-wide pollution. I really loved Desiccated for its powerful message and flawless execution, and have no hesitation placing it amongst my all-time favourite SummerWorks dance productions. Have you ever walked out of a venue and wondered what you just watched? That’s exactly how I felt after viewing LIGHT AT THE END OF THE TUNNEL 2.0. Two young women wrap themselves in bed sheets, prance around the stage for about half an hour and rearrange props for no discernable reason. Oh, sometimes they also scream and bark like a dog for the hell of it. I’m actually quite a fan of abstract and experimental dance pieces, but there really wasn’t much dance going on – unless you count the last 10 minutes when the performers stand up on a pedestal and gyrate to some club-ish dance music. The duo also seemed enamoured with awkwardly staring down random audience members to illicit easy laughs. It seemed to work the first few times, but after the 10th, 20th time, the novelty had completely run out. Maybe I just didn’t get it. But without any semblance of story, message or purpose, understanding the motive or meaning behind this piece was just not in the cards. At least only a few people walked out. Desiccated and LIGHT AT THE END OF THE TUNNEL 2.0 are currently playing as a double feature at The Theatre Centre Mainspace (1115 Queen Street West). All individual SummerWorks tickets are $15 at the door (cash only). Tickets are available online at http://summerworks.ca, by calling the Ticketwise Call Centre at 416-907-0468, or in person at the SummerWorks Info Booth – located at SummerWorks Central Box Office at Factory Theatre (125 Bathurst Street). Open August 4-16 from 10 AM – 7 PM (Advance tickets are $15 + service fee). I was really nervous for the second piece after I read your review but you were right: you didn’t get it. Did you not notice that the dancers were slowly covering up their bodies when they were staring down the audience? What did you make of the chattering young man holding a “whoops” sign while a silent woman dragged her body across the stage? How about the mirror reflecting yourself back to you as you watched them “gyrating” (which looked to me more like a mechanical effort to keep dancing)? Contemporary dance is hard sometimes, but I feel like you made up your mind about this one early on and then refused to engage with it.